NEW YORK (September 30, 2015) – Con Man premieres exclusively on Vimeo On Demand today. 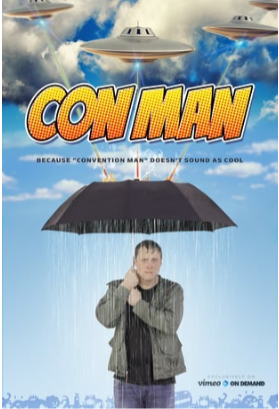 Three new episodes of the series will premiere every Wednesday for four weeks.Con Man is now available to rent for $14.99 at Vimeo.com/OnDemand/ConMan. Con Man centers on the post-show life of Wray Nerely (Alan Tudyk) the co-star of “Spectrum,” a sci-fi series, which was canceled before its time and went on to become a cult classic beloved by fans. Wray’s good friend, Jack Moore (Nathan Fillion) starred as the series Captain and has gone on to become a major celebrity, while Wray (Tudyk) hasn’t found his desired level of stardom. Wray is the begrudging guest of sci-fi conventions, comic book store appearances, and different pop culture events; however, everything is not as it seems from the outside.The series will explore these events and all the weird and crazy things that happen to them along the way. Con Man was funded via Indiegogo, resulting in a record-breaking 3.2 million dollar campaign. With the support of over 46,000 fans from around the world, Con Man now stands as the third highest funded film campaign on any crowdfunding platform ever. This entry was posted in PopArtsPlace, Television and tagged Alan Tudyk, Amy Acker, Austin Powers, Battlestar Galactica, Buffy the Vampire Slayer, Con Man, Eastsiders, Family Guy, Felicia Day, Firefly, Gina Torres, Indiegogo, james Gunn, Jewel Staite, Joss Whedon, Lord of the Rings, Mindy Sterling, Nathan Fillion, person of interest, Sarah Connor, Sean Astin, Sean Maher, Serenity, SEth Green, Suits, Summer Glau, Terminator, Tricia Helfer on September 30, 2015 by Kay. A body covered in meaningful, and useful to the plot, tattoos is not a first… think Prison Break. But there are significant differences. In Blindspot they are on a woman who has no memory, a person who is rediscovering herself — and it is likely a safe assumption each week she will uncover the meaning of another one of the marks on her body. In the first episode not 1 but 3 of the tattoos were revealed to have meaning, we also discovered that there was a particularly heavily inked area that was covering up a tattoo she had before… whatever life-changing event happened to leave her with no memory and a body covered like a treasure map full of clues. With the “back 9” episodes having been ordered to script, it looks like we can safely hope for a complete first season of Blindspot, which hopefully means a satisfying arc, with a few answers along the way. This entry was posted in PopArtsPlace, Television and tagged 300: Rise of an Empire, Agents of S.H.I.E.L.D., Ashley Johnson, Audrey Esparza, Bethany Mayfair, Black Box, BroadChurch, Brooke Solvang, Caliph Jones, CJ Parson, Dr. Borden, FBI Agent, Growing Pains, Jaimie Alexander, Jane, Jane Doe, Kelly Aaron, Kurt Weller, Kyle LaColla, Logan Smith, Marianne Jean-Baptiste, Michael Gaston, Much Ado About Nothing, NBC, Noel Ramos, Patterson, Ramirez, Rob Brown, Sawyer Weller, Strike Back, Sullivan Stapleton, Tasha Zapata, The Royals, Thomas Carter, Thor, Thor: The Dark World, Treme, Ukweli Roach, Without a Trace, Young Jane on September 28, 2015 by Kay. Another “throwback” clipping, this one from 2007, before Jaimie Alexander had a Blindspot, and before the world discovered Thor’s friend Lady Sif. Unfortunately when I saved the clipping I did not note what magazine I clipped it out of. This entry was posted in PopArtsPlace, Television and tagged Blindspot, Jaimie Alexander, Marvel, Sif, Thor on September 27, 2015 by Kay. 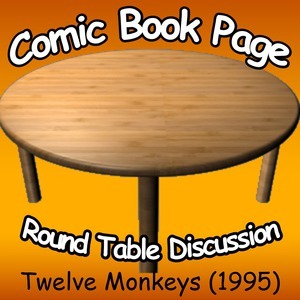 John Mayo, of ComicBookPage, and Kay Kellam, of PopArtsPlace, have a spoilers filled discussion about the Twelve Monkeys movie from 1995. With Syfy having finished a season of the tv show 12 Monkeys, based on the premise of this movie, we decided it was time we sat down to not only watch the original film, but speculate on how it could evolve into a show we are looking forward to binge watching. For those who have not yet seen the movie, and have a Hulu subscription, with the Showtime Add-on, you can stream Twelve Monkeys through your Hulu account. The first season of SyFy’s 12 Monkeys is also available on Hulu. This entry was posted in Movie, Podcast, Podcasts, PopArtsPlace, Review and tagged Aaron Michael Lacey, Agent No. 1, Agent No. 2, Anchorwoman, Anthony 'Chip' Brienza, Astrophysicist, Barry Price, Bee, Bill Raymond, Bob Adrian, Botanist, Brad Pitt, Bruce Willis, Carol Florence, Charles Techman, Chicago PD, Chris Marker, Christopher Meloni, Christopher Plummer, Chuck Jeffreys, Cole, County Hospital, David Morse, David Webb Peoples, Detective Dalva, Detective Franki, Dr. Casey, Dr. Fletcher, Dr. Goines, Dr. Goodin, Dr. Peters, Drucie McDaniel, Engineer, Ernest Abuba, Evangelist, Fale, Felix A. Pire, Felix Pire, Frank Gorshin, Frederick Strother, Future, Geologist, H. Michael Walls, Harassed Mother, Harry O'Toole, Irma St. Paule, James Cole, Janet Peoples, Janet Zappala, Jann Ellis, Jeffrey Goines, Joey Perillo, John Blaisse, John Panzarella, Johnnie Hobbs Jr., Joilet Harris, Jon Seda, Jones, Jose, Joseph Melito, Kathryn Railly, Korchenko, L.J. Washington, La Jetée, Law and Order, LisaGay Hamilton, Louie, Louis Lippa, Lt. Halperin, Madeleine Stowe, Marilou, Matt Ross, Michael Chance, Microbiologist, Movie, Nell Johnson, Officer No. 1, Old Man Patient, Pat Dias, Patient at Gate, Paul Meshejian, Poet, Prisoner, Professor, Raspy Voice, Rick Warner, Scarface, Simon Jones, Special Victims Unit, Stan Kang, SVU, SyFy, Teddy, Terry Gilliam, Thomas Roy, Thug No. 1, Thug No. 2, Time Travel, Tiny, Twelve Monkeys, Vernon Campbell, Waltzing Woman Patient, Ward Nurse, WWI Captain, WWI Sergeant, X-Ray Doctor, Zoologist on September 25, 2015 by Kay.